EARLIER TODAY APPLE (NYSE:APPL, NYSE:INTL) announced its new MacBook Pro notebooks featuring Thunderbolt I/O , a newly developed interface by Intel and Apple which was previously known as Light Peak. Now things didn’t quite develop the same as Intel’s preview of the technology during IDF, as instead of using optical cables and a USB port like interface, Thunderbolt in Apple’s implementation uses copper wires and a mini DisplayPort interface. So what is Thunderbolt and what does it bring to the table? Well, for starters it’s a 10Gbps high-speed data interface that allows for a wide range of data to be passed through it with the main interfaces being DisplayPort and PCI Express. However interfaces like USB, FireWire, eSATA, Ethernet or just about any other type of standard interface could easily be added via adapters thanks to the use of PCI Express signaling. Intel and Apple have left the peripheral choice up to their partners, but we would expect to see a fair few docking stations and what not to crop up over the next few months that will allow for all types of connectivity. With 10Gbps worth of bandwidth, there’s plenty to play with, but bear in mind that if you connect a display, the DisplayPort interface will eat up some of this bandwidth. One feature that will come in handy is that Thunderbolt supports daisy chaining, so up to six devices can strung together, or five devices and a display. We’d envisage that Apple will fit some kind of Thunderbolt hub inside its next generation of displays which allows for various peripheral interfaces to be built into the display, something that would be a boon for notebook users that would only need to connect a single cable to the monitor and still be able to interface with all the desktop peripherals. This actually has some interesting ramifications in the notebook and even potentially the tablet and phone market in the long run, as it would lead to a single port that would handle all of the I/O for these types of devices. 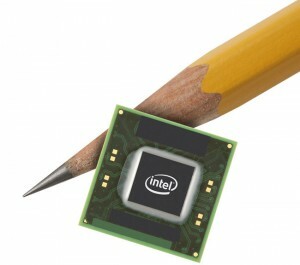 We might be some time away from that happening though, especially as the chip required at the moment is rather large and so far it’s limited to working with Intel’s own chipsets. On top of that it requires four lanes worth of PCI Express bandwidth, which is quite a lot, but not enough to cause a problem in say a notebook. A docking station could house all the peripheral controllers needed, as long as they don’t use up too much of the bandwidth. This might herald the return of the docking stations, just with a much simpler implementation. 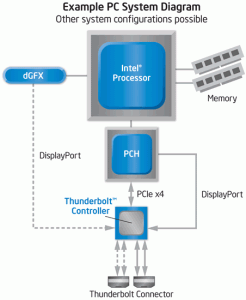 What we’re curious about and what hasn’t been mentioned at all is if/when we’ll see Thunderbolt on desktop PCs. This seems slightly trickier to implement than on a notebook, at least if you intend to run the signal from a discrete graphics card through it. Maybe this is something LucidLogix new Virtu software could help out with, but it also means that you’d need a motherboard with a mini DisplayPort connector on it and this is something we so far haven’t seen. That said, we wouldn’t put it past the motherboard makers to try and implement this solution on their upcoming Z68 board as an extra selling point. As for partners, well, currently Aja, Apogee, Avid, Blackmagic, LaCie, Promise and Western Digital have signed on to add Thunderbolt support to their devices. Aja, Avid and Blackmagic all make high-end video editing hardware and it’s not hard to see why they’re interested in a new, fast external interface to which they can connect their high bandwidth hardware, especially as we’re looking at an interface that’s going to end up being over twice as fast as USB 3.0 thanks to lower overheads due to the PCI Express signaling. Apogee on the other hand makes high-end, studio grade audio interfaces, again something that potentially uses up a lot of bandwidth and it’s another market where Apple is very strong outside of video editing. LaCie, Promise and Western Digital will all offer storage solutions with Thunderbolt interface and Apple has already revealed the Pegasus RAID from Promise and the Little Big Disk from LaCie as the first two devices to support the new interface. However, Intel and Apple haven’t sold us on all of the features of Thunderbolt and the most disappointing aspect in our view is the fact that the power is once again limited, albeit not as badly as on USB, we’re still stuck with a fairly paltry 10W. This means that something like a standard desktop hard drive won’t be able to be powered directly from the bus, but would require its own power adapter once more. This seems like a major oversight in our eyes, one that should’ve been easy to correct early on in the development stage. We’re also wondering about the whole daisy-changing thing, as it could get quite messy unless it’s somehow possible to split the signal as per FireWire, although this isn’t clear at this point. On top of this, Intel has pretty much killed all the advantages USB 3.0 had in one fell swoop, although this isn’t exactly the full story. In as much as Thunderbolt is going to offer more than twice the bandwidth of USB 3.0 in practical terms, USB 3.0 is backwards compatible and judging by the picture of Intel’s Thunderbolt controller, USB 3.0 is going to be a lot cheaper. In fact, to get USB 3.0 on one of the new Mac’s, a simple Thunderbolt to USB 3.0 adapter could be made, something that wouldn’t have been possible with the exception for the 17-inch model with an ExpressCard slot. That said, this isn’t the most elegant solution, but as this would be the same for any other peripheral interface, it looks like this might very well be the way forward.